The idea for a low carb cauliflower hummus has been churning around in mind for weeks now, and I finally had a chance to bring it to fruition this past weekend. And you DO NOT even know how excited I am to share this recipe with you guys! Hummus and I have been BFF’s for a long time now…especially since Weight Watchers made garbanzo beans a 0 Points food. I make my own hummus frequently, and love to try out different recipes, as well as store-bought and restaurant versions. Well, let me just tell you that this Roasted Cauliflower Hummus is one of, if not the BEST hummus recipe I’ve ever tried. Seriously. I am obsessed. Since this weekend, I’ve been back to the store twice, just to buy more cauliflower so I could make more of it. The magic of this homemade hummus recipe is in the roasting of the cauliflower. It’s oven roasted until it begins to blacken and caramelize, and THIS is what creates the most wonderful, smoky, heavenly flavor that makes this hummus so magically delicious. I honestly thought I would miss the garbanzo beans a little. But, nope. Nada. Not one bit. In fact, I may never revert to garbanzo bean based hummus again. It is THAT good, folks. 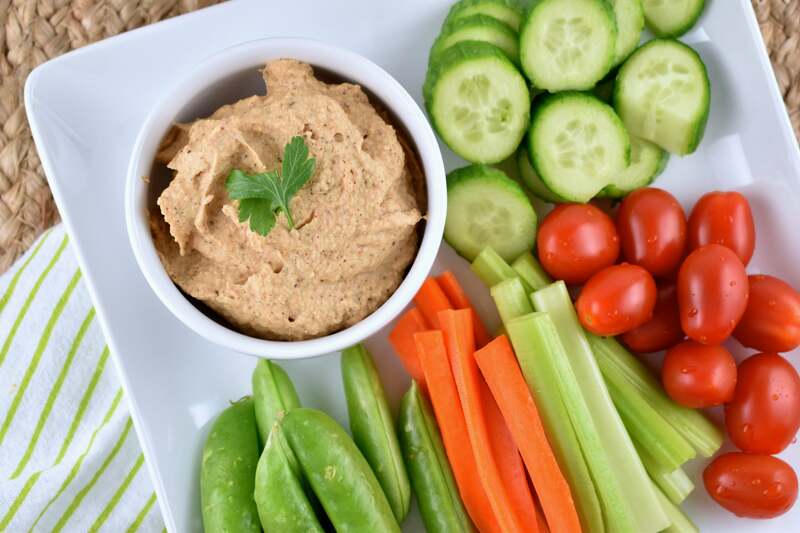 Serve it as a side to dip your veggies, apple slices, crackers, or pita chips in. Spread it into your favorite wrap. Dollop it onto your salad. Smear it all over some grilled chicken breasts. Heck, just grab a spoon and go to town, because this smoky, low carb, roasted cauliflower hummus is about to up your hummus game like you’ve never thought possible. As an added bonus, this cauliflower hummus is super nutritious and good for you! It’s Paleo friendly, Keto friendly, and Whole 30 compliant too. So basically, you have no excuses not to try it. I made it in my Blendtec, which gave it the most divine and perfect creamy texture. I also tried it in my food processor, and while it still tasted great, I preferred the creamier texture of the blender version, so I’d suggest sticking with that. 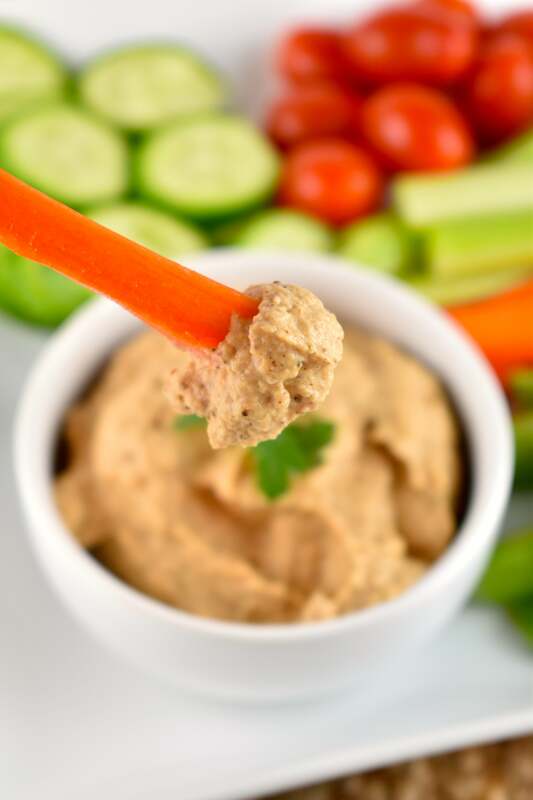 This cauliflower hummus makes a great base for other flavors, so if you want to get creative, and try adding some other flavor components, you certainly can! If you’re looking for some ideas, try it with jalapenos, cilantro, sun dried tomatoes, olives, or roasted bell peppers. So go grab some cauliflower and get this dip made ASAP! Then please make sure to come back and tell me what you think!! I’m dying to hear if you all love it as much as I do! 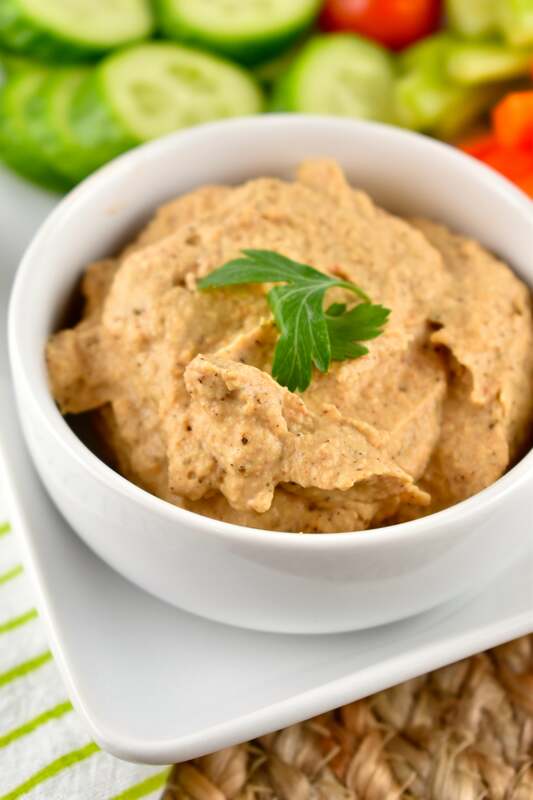 A creamy, smoky, low carb hummus made with roasted, caramelized cauliflower instead of garbanzo beans. 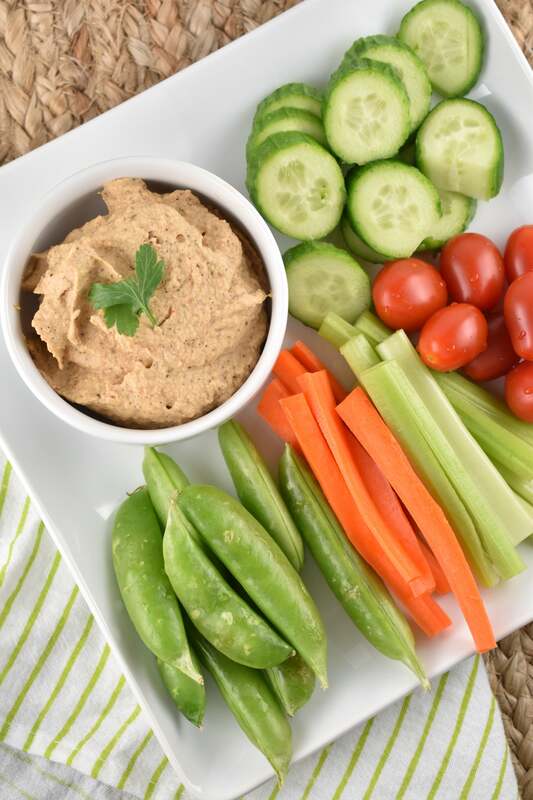 It’s the perfect healthy snack idea, and can be used so many ways. Preheat oven to 425. Line a rimmed baking sheet with parchment paper. 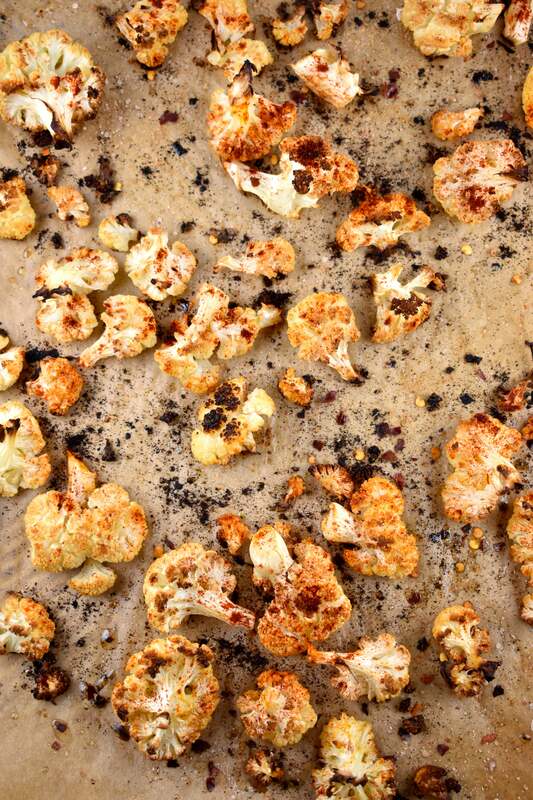 In a bowl, toss cauliflower with olive oil, smoked paprika, red pepper flakes, and salt. Spread florets evenly out on baking sheet. Roast in oven until tender and slightly blackened, about 20 minutes. Let cool for 5 minutes. Combine all ingredients in a blender, and puree, adding additional water if necessary, until smooth and creamy. I am so excited to try this recipe! I love roasted cauliflower and happen to have a head on hand. Plus, I am recently bought a Blendtec so this gives me something else to use it for! !